The Yard-Man 30 Inch Snow Blower is powered by the exactly the same engine used to power the slightly smaller Yard-Man 28 Inch Snow Blower. This is an 0.36 liter Yardman engine. It also has the same starting options. However there are a number of major differences. The first is the fact that it’s clearing width is 2 inches wider at 30 inches (0.76 m). However it’s intake height remains the same at 0.53 m (21 inches), although with the addition of drift cutting knives, it can handle far deeper snow provided that it’s not too heavily compacted. Snow first enters the housing of the Yard-Man 30 Inch dual stage snowblower where it’s quickly broken up thanks to the serrated steel auger than spins rapidly, easily cutting through even very wet or compacted snow and ice. As it cuts up the snow, the auger also brings it to the center of the machine where the it gets further broken up by the impeller. The impeller consists of several steel blades and has a diameter of 0.3 m (12 inches). Once the snow passes through the impeller, it’s then shot out through the chute away from the snow blower. The chute is controlled by a 4 way joystick that can move it both up and down as well as left and right. Also sitting at the top of the chute is the deflector which gives even greater control to the operator as to where the snow ends up. The Yard-Man 30 Inch 2 stage snow thrower comes with a 2 year warranty if you are an individual purchasing it for personal residential use. The total weight of the machine before fuel and oil has been added comes to 104.3 kg (230 lbs). 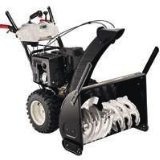 Click Here To Buy The Yard Man 30 Inch Snowblower.